When Griffin Bing's class goes to a floating zoo,they don't expect to see animals being treated so badly. They don't expect to find Elvis, Dog Whisperer Savannah's pet monkey who's been missing for weeks. And they really don't expect to have to hide the animals once they've rescued them! What happens in this sequel to Swindle? In Hatchet, 13-year-old Brian Robeson learned to survive alone in the Canadian wilderness, armed only with his hatchet. Finally, as millions of readers know, he was rescued at the end of the summer. But what if Brian hadn't been rescued? What if he had been left to face his deadliest enemy--winter? Read this book to find out! Miguel's life is just beginning. Or so he thinks. Fifteen-year-old Miguel leaves his rancho deep in Mexico to migrate to California across la linea, the border. But Miguel's carefully laid plans change suddenly when his younger sister Elena stows away and follows him. Together, Miguel and Elena endure hardships and danger on their journey of desperation and desire, loyalty and betrayal. Will Burrows has little in common with his strange, dysfunctional family. In fact, the only bond he shares with his eccentric father is a passion for archaeological excavation. So when his dad mysteriously vanishes, Will unearths the unbelievable: a subterranean society that time forgot. Kidnapping. Explosions, Murder. This is no ordinary weekend. But then, James Bond is no ordinary boy. . . . In a north London cemetery, a professor is kidnapped at gunpoint. Then, a suspicious letter crammed with cryptic clues arrives at Eton. To decipher the deadly mystery, James Bond must take a series of dangerous gambles. Once the code is cracked he has just forty-eight hours to save the professor from the dark forces that threaten to destroy them both. And if they can't escape, it's not only their future under threat. It's the rest of the world's. . .
Hero-narrator Josh is sent to stay with a relative in Carbon City, Washington. From the moment he arrove at his aunt's old country house and sees her using a shotgun on a bat in the kitchen, he knows he has crossed into a life new and strange. With no TV, CDs, or DVDs, Josh occupies himself with a long bike ride into town, past a cemetery and a tree house said to be haunted. And haunted it is. Its ghost, an old coal miner who died in a disaster in 1903, has a mission for Josh; he wants the boy to dig up his leg, which was buried before the miner died, and reunite it with the rest of him. When Josh exhumes the limb, he discovers a buried box of cash. Read on to find out the conclusion to this book! They told him his uncle died in a car accident. Fourteen-year-old Alex knows that's a lie, and the bullet holes in his uncle's windshield confirm his suspicions. But nothing prepares him for the news that the uncle he always thought he knew was really a spy for MI6--Britain's top secret intelligence agency. Recruited to find his uncle's killers and complete his final mission, Alex suddenly finds himself caught in a deadly game of cat and mouse. 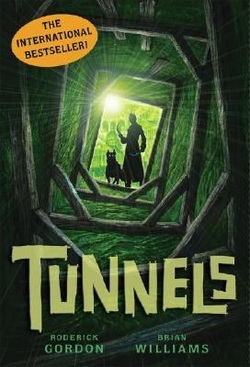 Seventeen-year-old Johnny Least-Weasel, who is better known for brains than brawn, worries about his missing grandfather, and the grandfather, Albert Least-Weasel, struggles to survive, caught in his own steel trap in the Alaskan winter.